For release December 28, 1962 ATLANTA 22, GEORGIA ol l,. brought reports of 19 cases of poliomyelitis (16 paralytic). parable week in 1961 accounted for 13 cases (10 paralytic). tively. No new case concentrations have been noted. is shown in the following table. virus vaccine of all three types in non-epidemic areas. among individuals in contact with vaccinated persons. Some of the cases previously accepted as "compatible"
by the vaccine. Cases have been judged as "compatible"
do not exclude a vaccine relationship. patible" is seven, of which 4 are over 30 years of age. less over-all, but higher for those over 30 years of age. For Type II there is still no indication of risk. two being judged "compatible" and two "excluded." spread has posed no significant hazard. from a special report submitted by the California State Department of Public Health. 2. The numbers in parentheses indicate intervals from feeding to onset of paralysis. 4. Considered a "compatible" case if laboratory work in process is not inconsistent with a vaccine relationship. 5. Type II vaccine fed 2 days before specimen collected. 6. 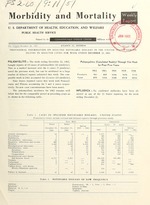 Considered (and listed) with relation to Type I and Type III vaccine administration. 7. Considered (and listed) with relation to Type II and Type III vaccine administration. 8. Type II vaccine fed 8 days before specimen collected. 9. Also compatible with Type I household contact spread. 10. Contact in adjacent apartment. N rth Dal lota. .. ..... .. Totals for previous weeks include reported corrections. NOTE: All deaths by place ooccurrence. and those planning foreign travel.